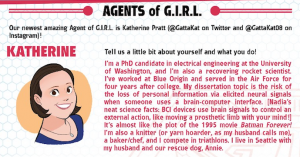 Katherine Pratt, an ECE Ph.D. candidate and a 2018 TechCongress Fellow, is featured in the fourth issue of Marvel’s The Unstoppable Wasp. She is an Agent of G.I.R.L. : Genius in Action Research Labs, a feature created by the comic’s creator, Jeremy Whitely. Each issue focuses on super hero engineers and scientists. Learn more about Pratt in her interview in The Unstoppable Wasp.